Massive New Wet n Wild Display! 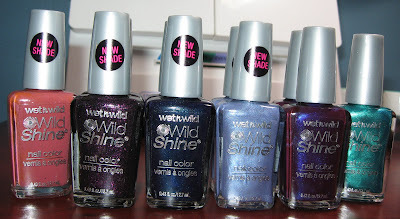 Above: Wet n Wild's offering of new Megalast polishes has a total of 24 shades. I picked up the seven shown above and was so happy to see creme pastels after the 30" of snow we've gotten over the past 3 days! L-R: Red Tape (c), Heat Wave (c), Tropicalia (c), Club Havana (c), Haze of Love (c), Under Your Spell (s), Blackmail (s & g). Above: The new Wild Shine display has 18 slots and 16 shades (2 shades fill 2 slots). Some, like the Megalasts, say 'New'. I picked up L-R: Casting Call (c), Night Prowl (g), Blue Moon (s & g), Rain Check (s), Eggplant Frost (f & i), Caribbean Frost (f). Above & Below: Blackmail is the one I zeroed in on immediately. It appears to be a charcoal shimmer with multi-color glitter. Below: Bottle close up of Blue Moon, a deep inky Indigo shimmer with turquoise micro glitter. 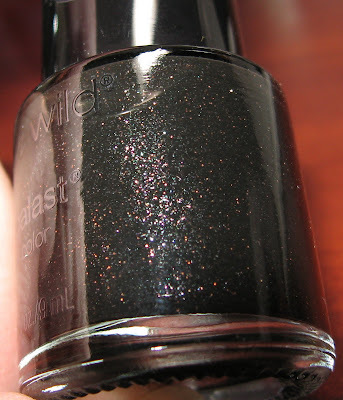 Below: Night Prowl is a blackened charcoal shade with violet glitter. I swatched it on paper and was surprised to see it was charcoal rather than purple. Below: A sampling of just some of the eye shadow palettes on the new display. Top L-R: On Cloud Nine, Knock on Wood, Sweet as Candy. Bottom L-R: Pride Orgueil, Lust Desir. I did spell those correctly! The cranberry glitter shadow in Lust Desir is very pretty in real life. Top Shelf-'Variety of Vibrant Color & Effect' and these are the small round polishes in the photo above. They are priced at $1.89 each and are .30 fl. oz. There are 24 shades, 9 of which have 'NEW' on the label. I picked 7 of them and in my opinion, the ones I picked up were the nicest shades. There are lots of cremes, 2-3 white and off white cremes, a black creme, some shimmers that didn't look terribly exciting, other than the 2 I picked up. 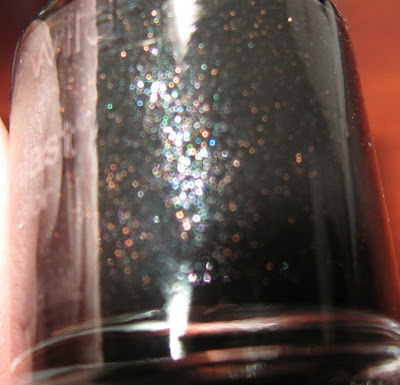 Blackmail is an amazing shade and I can't wait to try it out. Second Shelf-this shelf was filled with eye shadows, trios, singles and the 6-color ones shown above. I didn't count them, but there were quite a few other selections in a variety of colors that I didn't pick up. 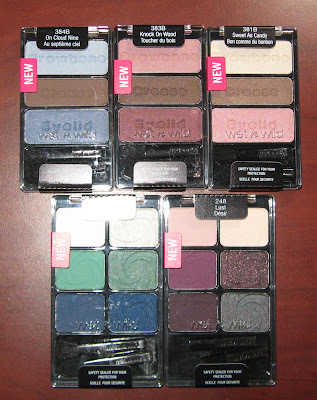 The trio's are priced at $2.84, while the 6-color palettes are $4.69. I'm hoping these are as nice as their offerings of shadows over the past couple of years. Third Shelf-I honestly didn't pay too much attention to this one, other than to note that it was all lip gloss and lip stick, and I believe the lip stick was advertised as matte. Fourth Shelf~again, this was not the shelf I spent the most time looking at! It was all blush singles and mineral foundation, if I recall. The blush singles came in about 8-10 shades and they were quite large. Fifth/Bottom Shelf-More nail polish, and these are the taller Wild Shine ones pictured above. The display read 'Long Lasting 5 Day Chip Resistant Polish' and there were 18 shade slots. I did notice there were 2 slots for a black creme and a red creme, so I believe there are 16 shades total. These were priced at 93 cents each and about one third of them have "New Shade" on the label. I hope that helps you in your shopping endeavors! 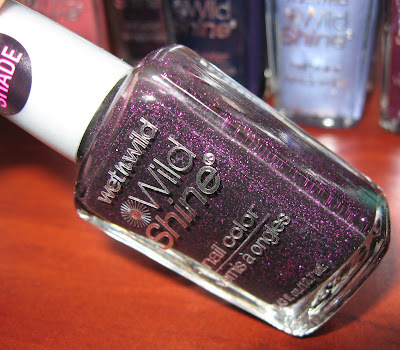 You'll notice that I bought 2 shades of some of the colors, so there's a hint as to this Friday's Follower Freebie! Those look awesome! Night prowl looks pretty amazing, lol I would've gone nuts if I saw that display too! Blackmail and Night Prowl look great! I'll keep an eye out for the new displays. I'm finding myself to be quite drawn to cremes lately! Wow! Wet'n'Wild has some cute stuff coming out! I love the first nail polishes and the eye palettes colors are gorgeous. I've only used their lip glosses, but I shall have to take a look at these too! AHAHA!! A salesgirl at CVS just told me these would be in very soon, a whole new set of products coming up at the beginning of February! I'm very excited to see your previews, you took excellent notes. I love the colors you chose too! You know, I have Eggplant Frost and Carribean Frost, you're going to LOVE the Eggplant one in particular, I think. Those are the only two in your whole haul I think I've seen before! I'll be crossing my fingers they show up earlier than February here! have fun to try them all out!! Finding brand new colors of cosmetics is so exciting. Just love looking at all the pretty shades. Love nails polish, lipsticks and eyeshadows. I feel like I can never get enough. Those polishes look really pretty. I don't own too many Wetn'Wilds. I wore one last week and it really didn't chip. I finally got some tip wear after a few days. The very first polishes look so cute! I feel a need to go and buy a bunch of these... I love some of their eyeshadow palettes. amusedPolish~so they have different ones there than here? Interesting! I'd love to see some of the ones you have. gildedangel~the pastels really caught my eye. So Spring-like. colormepinkenblue~sadly, I have the Craze's but haven't used them yet! Jessica~I think those two just might be the first ones I swatch! I like cremes, but often make a mess when applying them, so I guess I should use them more and gain some practice. Mocha Mish Mash~their eye shadows have been really impressive the last few years. Great quality, and cheap! Nicole~I was getting some strange looks when I was taking notes in the store! I've seen the two you mention on other blogs and have always admired them, but they were never in the older displays I saw. Hope you find them when your store puts them out! Skye~yes, too many! Where to start?!!! hitomi~I know, less than $1.00 for some of them. I wish everything was priced like that! Lucy~I know, I can't resist all of the colors. WnW polishes wear pretty well, considering how inexpensive they are. AnatuMonat~the little bottles are cute, aren't they :) Love their eye shadows, very pigmented. ~Lisa~I'm curious to see how opaque they are also. Do you get much WnW in Canada?